The Melancholy of Suzumiya Haruhi Wallpaper: together is fun!! Minitokyo »	The Melancholy of Suzumiya Haruhi Wallpapers » The Melancholy of Suzumiya Haruhi Wallpaper: together is fun!! 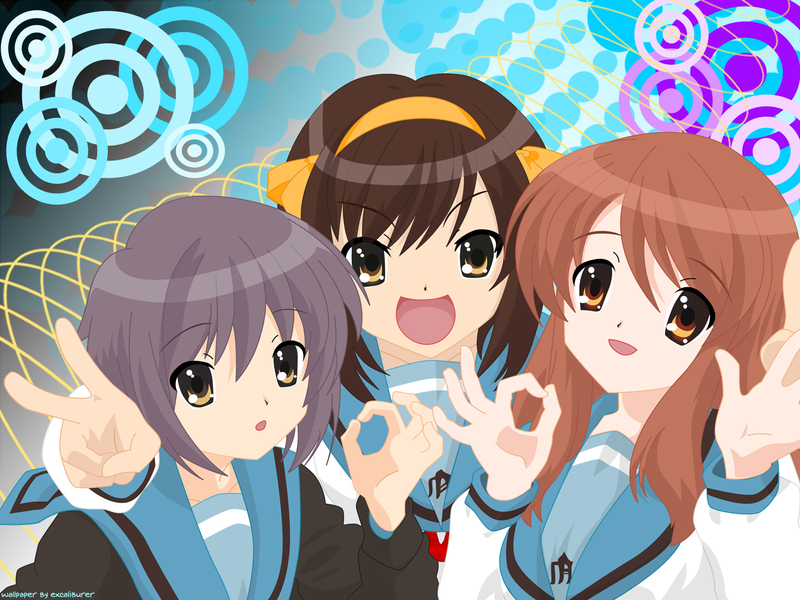 First, I trace Haruhi&friends at illustrator.. That's really made me confused because I just a beginner.. The first chara that I trace is Mikuru.. I have difficulty when I trace her hair.. Then is Yuki.. She more easy to trace than Mikuru (for me).. And then is Haruhi.. She was the most difficult of them.. Especially her hair.. After the chara's finished, I export that to photoshop..
Second, I open that&gave the backround.. I gave it gradient colors&shapes.. But, I think there are too much shapes on it..
Third, wrote the text&changed it to bitmap..
Little weird? Umm maybe.. Hehehe.. But thank you so much for you jakiita-san..
Loved,so nice,i love this anime,Raaaaaffffff!THANKS! Good Work!Congratulations to the artist!Bravo! Oh............. this is so cuteeee!